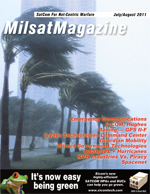 Launching any issue of our MilsatMagazine publication is an exercise in delight  the cooperation received from industry professionals, military commanders and government organizations is most appreciated  we relish the opportunity to learn something new each and every day, thanks to the informative articles, telephone calls, visits at trade shows, and press releases. The amazing factor is how well the MILSATCOM industry remains so flexible and viable, day after day, week after week, and month after month, to preserve and protect  a true testament to the creative approaches taken to product and marketing by various MILSATCOM market segments. Satellite communications is a critical technology for modern military operations. For units deployed around the world, it provides a high-speed communications backbone. It connects soldiers to each other and to central operations. And it enables them to stay united with friends and family back home. Major General (Ret.) H. Marshal Ward is the Chief Operating Officer of Integral Systems. He offers more than 40 years experience in the aerospace and defense industries. Previously, he served as Vice President and General Manager for the Space Systems and Electronics business area of BAE Systems. In this position, he was responsible for the inception of the business area and its growth by 2008 to US$270M in revenues. Ken Torok is vice president of Navigation and Communication Systems, responsible for leading Boeings MILSATCOM and Navigation businesses, including Wideband Global SATCOM (WGS), Global Positioning System (GPS) IIF, and Mobile User Objective System (MUOS) Payload program execution and mission success. He was appointed to this position in August 2008. To offer some insight into the leadership behind this crucial program, MilsatMagazine delved into Colonel Larrimores background  we asked him about what prompted him to join the U.S.A.F. as a career officer, as well as what other postings he has experienced during his career, including his most enjoyable duty station. The Colonel offered the following information as to his qualifications to manage the SBIRS Space Group at the Space & Missile Center at Los Angeles Air Force Base in California. In a market which already relies on satellite communications, the integration of high-speed connectivity is a highly exciting prospect. On April 18th, 2009, Dirk Traen of Belgiums international dredging and land reclamation specialist Jan De Nul N.V. received the news all ship operators fear: One of his companys vessels had been forcibly taken by pirates off the Gulf of Aden. The Satellite Industry Association (SIA) is a Washington D.C. based trade association that represents the leading satellite operators, service providers, manufacturers, launch services providers, and ground equipment suppliers across the globe. Since 1995, SIA has been the unified voice of the satellite industry on policy, regulatory, and legislative issues that affect the commercial satellite industry. The association actively promotes the benefits and uses of commercial satellite technology and its role in national security, homeland security, disaster relief and recovery, and the global information infrastructure and economy. As the commercial satellite industrys lead advocate, the SIA continually monitors the international and domestic regulatory landscape and works to advance satellite interests both at home and abroad. SIA member companies are actively involved in reviewing and commenting on spectrum, regulatory, telecom, international trade, export controls, government procurement, national defense, homeland security and industry trends among other key issues.